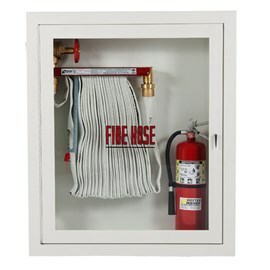 Complete line of fire extinguisher, fire hose, and access panel cabinets. We are the distributor for various manufactures of fire extinguisher and fire hose cabinets. Also available are access panels, key boxes, fire blanket cabinets, detention grade, and other specialized cabinets for industrial applications by Larsens and, JL Industries. First Aid Kits and related safety equipment for every need. First Aid Kits manufactured in sizes ranging from home use “emergency kit” to office and small commercial “25 person to large industrial “100 person”. Flame Retardant Liquid Manufactured by: New York Fire Shield. Excellent for display fabrics, FAA approved for airplane seatcover treatment, Christmas tree fire-proofing. Kitchen Grease Hood Filters Manufactured by: Kason – all sizes available; common sizes in stock for immediate shipment. Hood Light Globes and Wire Guards for kitchen grease hoods. Smoke and Carbon Monoxide (CO) Detectors Manufactured by: Maple Chase. Test Smoke for maintenance of smoke detectors. Rental, all types of portable fire extinguishers are available for rental on a daily or weekly basis. Signs – many varieties of fire/safety signs from different manufacturers are in stock. Silk Screened Replacement Glass for fire extinguisher cabinets. Fire Extinguisher and Fire Hose Covers for outdoors or other corrosive locations. Locks and Keys repair and replacement for fire extinguisher cabinets from all major manufacturers. Flamable Liquid Handling Equipment and Safety Cans manufactured by Securall. Flamable Liquid Storage Cabinets manufactured by Securall. Key Boxes for storage of emergency access keys by JL Industries. Escape Ladders for emergency escape from 2nd. and 3rd. story home bedrooms. Manufacturer by: Kidde Safety.